Summer in Winter Day (http://ashlen-kidspert.blogspot.com/2014/01/a-summer-day-in-middle-of-winter.html): I can't wait to do this day again this year! Max got a corneal abrasion. From a box. While he was playing. This just reaffirmed my belief that this kid is accident prone (http://ashlen-kidspert.blogspot.com/2014/02/this-is-how-we-do-snowy-day.html) Why is this one of my favorite moments you ask? Because it's pure Max and he was unbelievably brave and grown up through the entire experience and healing process. Finding out Max has A TON more allergies than what we thought (http://ashlen-kidspert.blogspot.com/2014/06/i-am-mom-of-allergy-kid.html): While I hate that he has allergies, I'm thankful that we know exactly what he's allergic to so we can do our best to prevent exposure and outbreaks. Writing a book, learning the ins and outs of publishing, and deciding on self publishing my book "just to try it out" (http://ashlen-kidspert.blogspot.com/2014/12/finding-inspiration.html): This has been the biggest, most challenging, yet exciting goal of my life yet...aside from having kids, because I'm certain the book wouldn't have happened if I didn't have the inspiration from my minis. Becoming a What The Flicka? contributor: This has given me so much to do, learn, opened numerous doors for me, and given me a wonderful community to be a part of. I am forever grateful to my friends who suggested I submit my work and to the wonderful editors who help support my writing in every way they can. My fun little distraction (aka my blog) got a whole lot more fun! Max entering first grade and Harrison four year old preschool. I absolutely love both of their schools! Watching many of my friends become mommies and daddies for the very first time. 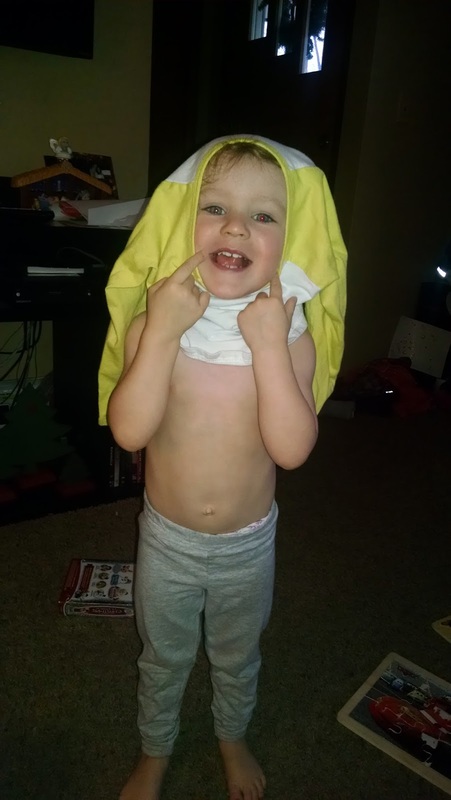 Having my two year old potty train herself one day. Our daycare walks around the neighborhood. There were many but each brought something new and entertaining. I am so glad I have this blog so I can capture and remember the many moments I have let slip away in day to day life. All of the bad days have made me a better mom and make me laugh as I look back on them. 2015 has A LOT to live up to and I can only hope it brings about more exciting changes and surprises. I plan to spend a good part of the beginning of the year giving myself some "mom breaks" (this includes a five day trip to Phoenix, AZ for my cousins wedding), a book party (details to come soon! ), writing one or two new books I've got ideas for (with my minis of course), continuing my blogging adventures and sharing my road in motherhood, having another epic summer with lots of kiddos (I'll even be hiring a helper for those busy summer days), a family vacation or two, and lots of adventuring throughout Iowa during our free time. A five day weekend for five Christmas's plus sick minis plus trying to get some marketing done for my book makes for a very tiring "break." All in all it was pretty great, we got to spend time with the people we love and there was an 11 hour sleep for me (unheard of these days!) so really no complaints about our busy five days. Christmas Eve we ran last minute errands, got the house in tip top shape (which really means there were just a few less toys on the floor than normal), celebrated Christmas with my mom's side of the family, looked at Christmas lights, and waited for Santa to come.....and while we "waited" we wrapped gifts, had an "old" friend over, and set up the video camera to catch Santa in the act. Christmas Day we opened gifts, relaxed, Grandma and Grandpa Sheaffer brought presents over, took naps, and went to my parents house for dinner and more presents. The day after Christmas was my favorite day of all: I slept 11 hours, woke up at 10:30 a.m., and stayed in my jammies until 5:00 p.m. That is my dream day! Saturday we spent at the doctor's office and then relaxing with sick kids. The youngest mini and I did make it over to my dad's side of the family where we quickly caught up with aunts, uncles, and cousins as quickly as we could. Sunday we relaxed, cleaned, made yummy food, and I finally got to do some marketing for my book (it's now available at Beaverdale Books for those in Des Moines interested in purchasing a copy). I could have done without the sick minis part, but I'll be dreaming of that 11 hours of sleep until next Christmas! Harrison got a catapult! Not a shocker: he loves it. 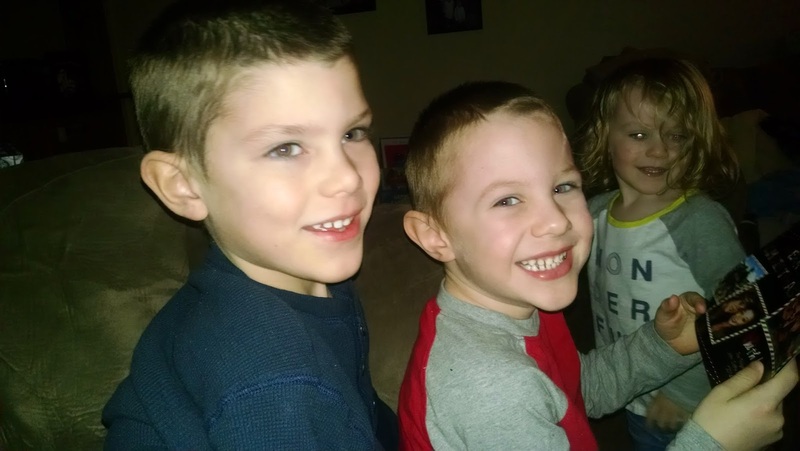 Reading "T'was the Night Before Christmas" to the boys after looking at Christmas lights. Elizabeth fell into bed right as we got home. 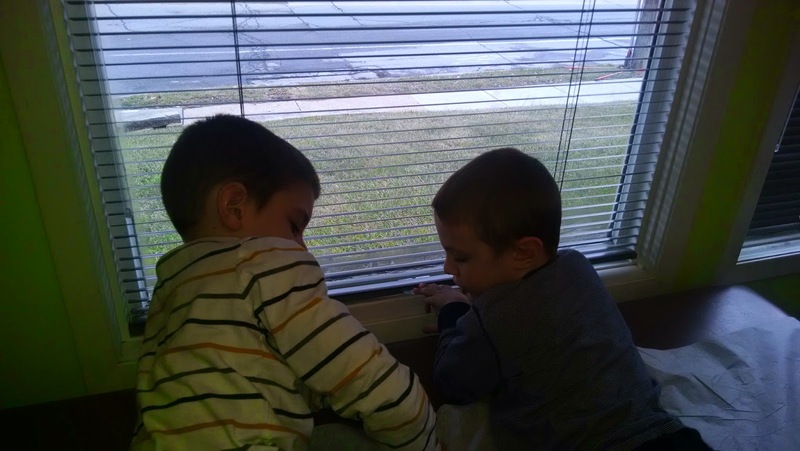 We kept track of where Santa was via the Norad Santa Tracker. The minute I announced "Santa's in America now!" Harrison started shaking, lip quivering and shouted "I'm ready for bed! I don't want Santa to see me!" I also had to promise that Santa would NOT come look at him while he slept nor touch his bedroom door. The boys woke up before anyone else in the house. 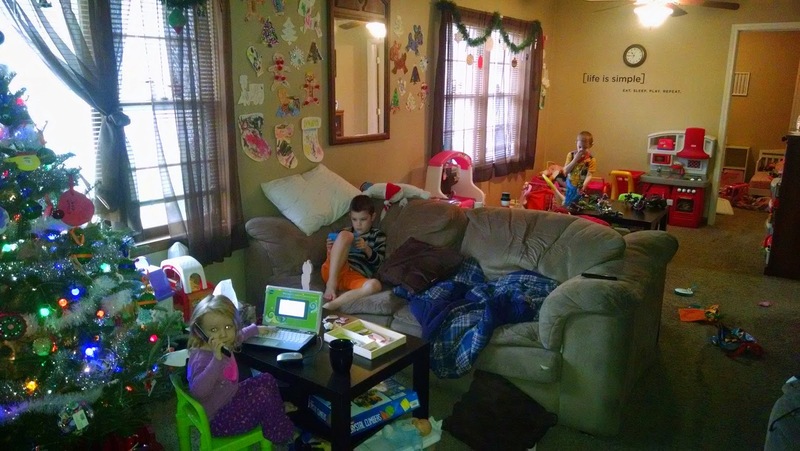 They quietly walked out into the living room, grabbed their gifts from Santa (chapter books and a computer) and took them into their bedroom until the rest of us woke up! First year we didn't get to see their reactions to their Santa presents. We've got A LOT of Barbie stuff now.....it's taking over Elizabeth's room. Waiting somewhat patiently for their next round of gifts. Max wanted to tell stories. Luckily we had one of the best story tellers, Grandma Ann, with us, who told stories about square dancing and life on a farm. Not a surprise that Max now wants to take square dancing lessons and has requested that we move to a farm. 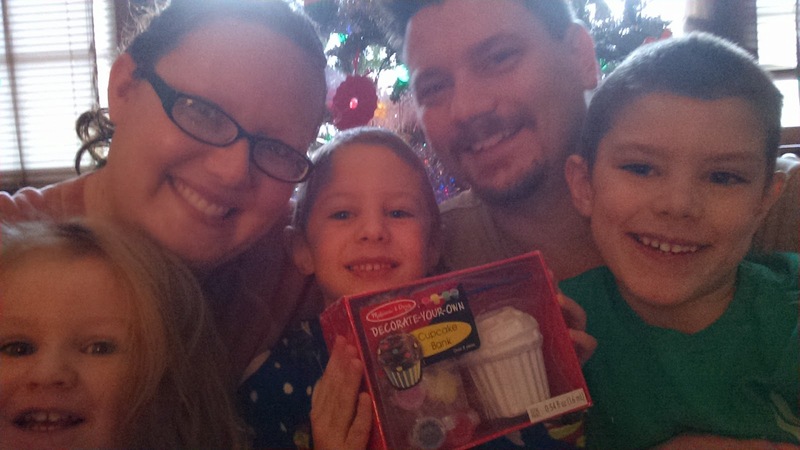 Our obligatory Christmas morning selfie. 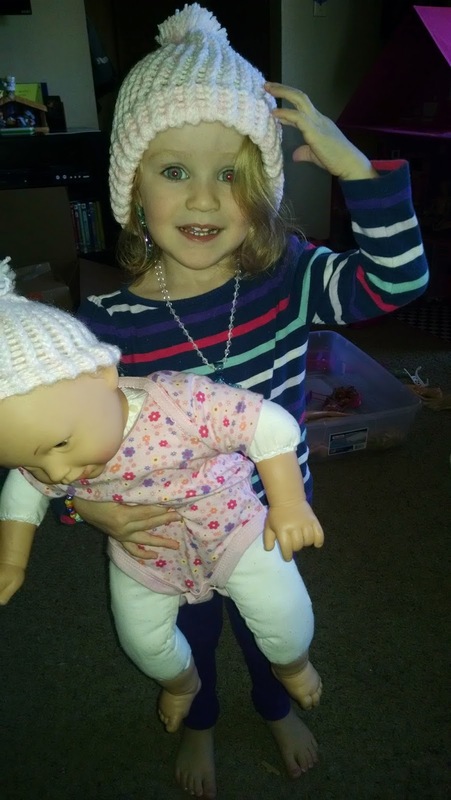 Elizabeth got a matching hat set so her doll could wear one too. 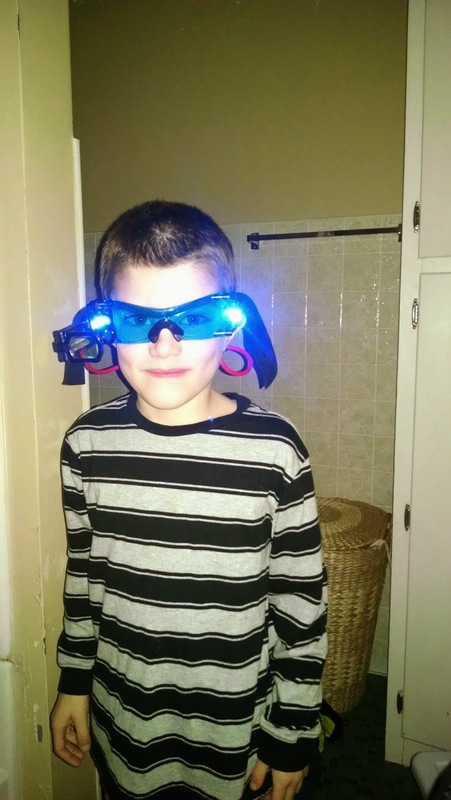 Max got night vision goggles so he can "spy on you while you sleep." I told him never to speak a creepy line like that to me again. The day after Christmas looked just like this. All. Day. Long. It was the best. After check ups, lots of blood work, finger pokes, and a shot, Max was diagnosed with strep for the third time in a month! I've been disinfecting like crazy ever since. The other two have a nasty virus that just cannot be kicked. It's been a rough winter so far. The boys weren't able to make it to my Grandma Ann and Grandpa Rich's Christmas, so Elizabeth and I brought their goodies to them. 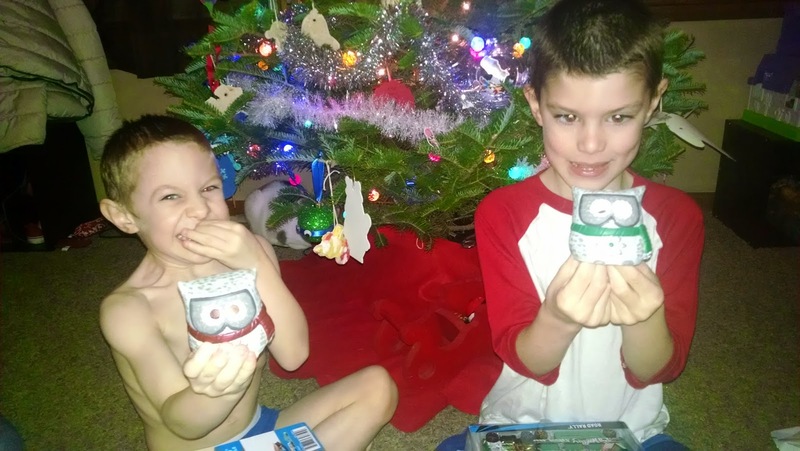 The boys are obsessed with their 3D owl ornaments this year! 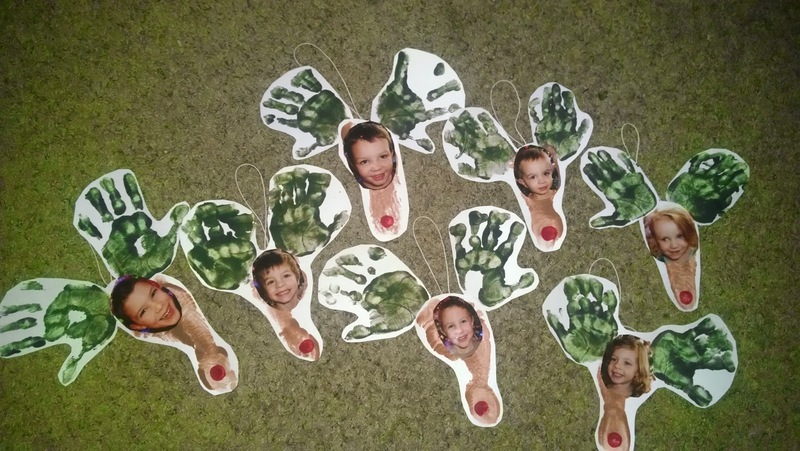 Every year my Grandpa makes each family member their own ornament. These were the first 3D ornaments he's ever done and they are the coolest. The owls even have the boy's picture inside. They now reside on the boy's shelf in their bedroom because they refuse to let me put them away. Of all of the Christmas decorations we've had, this year has been my favorite. 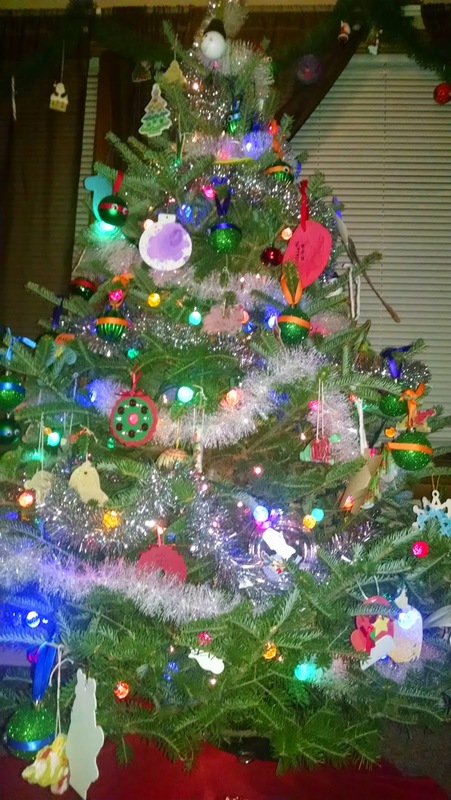 Our tree was absolutely beautiful, filled with homemade decorations the kids made throughout the month. Our walls and shelves were lined with unique arts and crafts I had the kids do as well. I had a hard time this year saying goodbye to our tree (it was losing needles quickly and I didn't want them to hurt the little feet that fill our house). I've always been more than happy to put away our Christmas stuff but this year I was rather sad to see it go. Mostly because of how wonderful everything looked and how it easily represented our entire month. The other part was because I know I won't be seeing the Christmas excitement in my minis eyes until next season, when they're another year older. We're slowly getting rid of the germs around here (hopefully) and have taken our free time to rest. We're looking forward to hitting up the Science Center lots this winter with our new family pass, going to a hockey or basketball game, and we're eagerly awaiting for our next Experience (http://ashlen-kidspert.blogspot.com/2014/11/experiences-for-christmas.html) from Santa that should be coming in the next few weeks! I left the house with the weight of mom guilt bearing down on my entire body. I yelled at my minis. Not just yelled at them to stop doing something, but the kind of yelling because I was pissed at their behavior. I was not their maid nor their waitress and they were complete asses to me. Even when I used my usual go-to's for handling things, their behavior just got worse. "I expect to be respected by you!" I yelled at them. Moments later my husband returned home from work and I happily left the house. Not a hug goodnight, not a kiss, just a slammed bedroom door as they lay in their beds. Even the threat of calling Santa had done no good. Usually I use my mom guilt to I think of a solution to our problem or come up with a new parenting technique or a new way to handle things. This time around the guilt choked me as I recalled my loud yelling to my children. I drove down the street when a brightly colored store sign come into view. In that moment, I gave into my mom guilt. I walked out of Toys R Us with a new train track system, figurines, and a few other gems to bring about the smiles that I had taken away. I got home, recruited the Hubs to help set the toys up, and then I got the boys out of bed to calmly apologize. That was my plan at least. I found myself saying "do you want to wake up and come spend some time with me?" "Sure!" they said as enthusiastically as they could in the middle of the night. We popped in a movie, had a snack, and played nicely with their new toys. I took the time to apologize and calmly explained how I expected their behavior to change. Will my kids still treat me like their waitress? Probably as I did nothing in this situation to teach them otherwise. Do I feel any better about how I handled the situation in the first place? Not really. Is my mom guilt gone? Absolutely. I usually take advantage of teachable times such as this, but on this night it meant more to me to go to bed with my heart full of love, the smiles I saw back on my minis faces, and free of any kind of mommy guilt. These were the busiest two days of my life but so much fun! We brought in a new special helper in the afternoons to help out with all of the extra kids I had around thanks to schools being out on Christmas break. 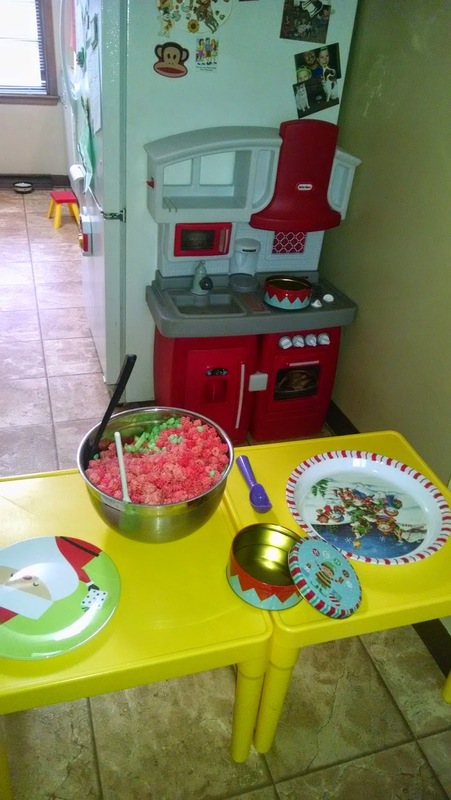 We played games, colored, had a Sensory Play Day, made cupcakes, had a balloon party (it's just as it sounds, a bunch of blown up balloons that the kids hit up in the air over and over again) and had our daycare Christmas party...all mixed in with the every day craziness. I scored a few new Little People puzzles from the Target dollar section. The big kids had a great time helping the younger kids put them together. 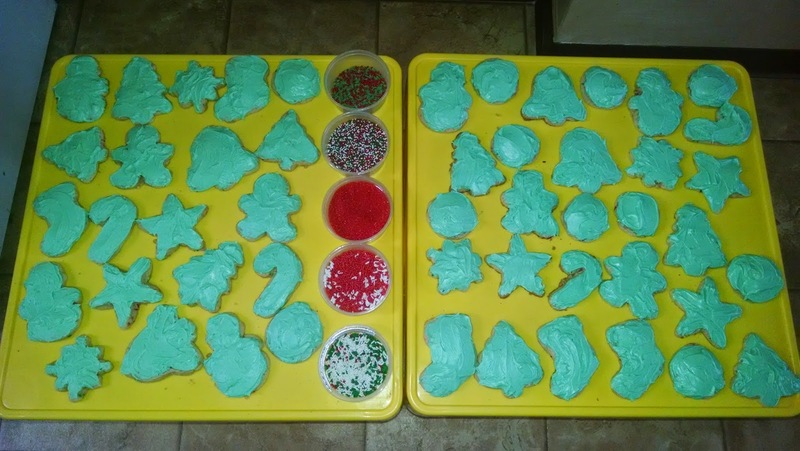 Our sensory activities: Christmas play dough (I used our salt dough ornaments recipes and put cinnamon in for the red and peppermint in for the green) and Christmas snow (I used this recipe: http://ashlen-kidspert.blogspot.com/2014/09/pumpkin-snow.html) and used cinnamon for the red and peppermint for the green. The kids love this stuff! Luckily it's an easy clean up because things get messy! Always a hit: a veggie tray in the middle of the living room. 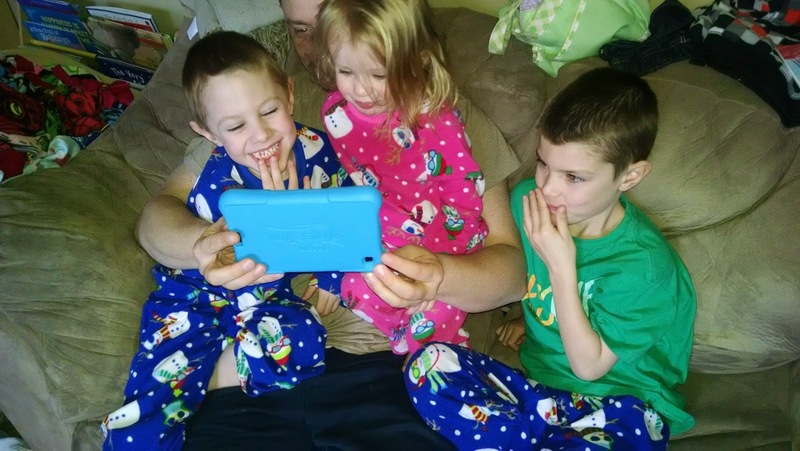 We watched a new winter episode of Daniel Tiger while the kids ate. By the end the tray was demolished and nearly every child had tried something new (or something they didn't like) at the encouragement of their friends. A card game while they ate apple slices. Our special helper for two afternoons was my cousin Silvia. 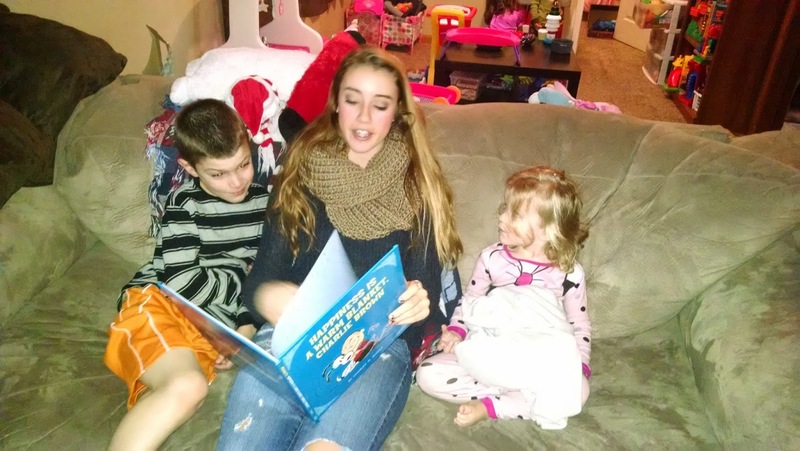 The kids loved having her around and it gave me a bit of a break! Paper plate wreaths. Last year the kids colored them with every color of green crayon they could find. This year we used paint. Their favorite part was choosing which bow to put on the top. A couple of our party games: Christmas tree bowling (our Christmas trees were 2 ltr. bottles filled with paint, they used the Snowball Fight as their balls) and Christmas tree ring toss. 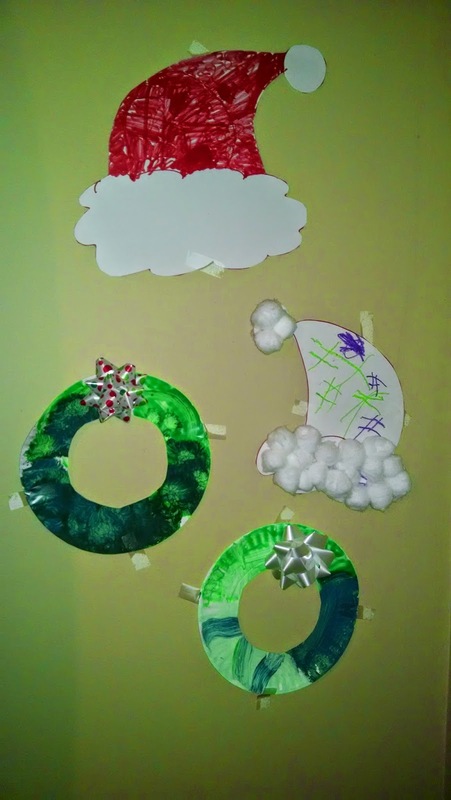 The rings were too small so eventually we just used the kid's paper plate wreaths that they made. The kids left the sidewalk chalk out in the rain. Before it was tossed, we got one more use out of it: coloring Christmas pictures with the wet chalk on construction paper. The kids had Silvia drawing flowers for them. Dancing with daddy to her favorite Christmas song: "Santa Baby." Her other favorite songs include "Shake It Off" and "All About The Bass." Next week will be another short week, but jam packed with fun. We'll paint, read our few New Year's books we have, enjoy a few of the new crafts the kids got, and have a New Year's party! We recently switched our youngest, third and last child, from her crib to a toddler size bed. She hadn't been sleeping well and was fighting going to sleep, so I decided she needed a change (or more so that I needed sleep). When we switched our oldest from a crib to a big bed, I was sad. With my middle I was relieved because he was safe (he began climbing out of his crib at 11 months old and I would fret every night that he would break his arm). With this one, I was super excited to chronicle the experience of switching to a big girl bed. See, switching our oldest was fairly uneventful. He listened well and did as he was told ("stay in your bed, it's time for sleeping" and he did just that). Switching our middle child was FULL of headaches. He wouldn't stay in his bed, took forever to fall asleep, and times that we awoke at 3 a.m. to find every light in the house on and him wandering around. Terrifying and irritating all at the same time. Helping daddy put her bed together. Night 3 looks exactly like the first two, as do naps. I'm completely bummed I don't have any hysterical tales or horror stories to share. It's been completely uneventful and I'm left feeling gypped that I didn't get to share a fantastically funny story. Although I do feel pretty lucky that number three isn't giving me any grief on this matter and my favorite new morning routine is hearing "mom! Mom! I come out now?" as I watch my bedhead little girl walk smiling through her door. 1.) "Mom, good news! I taught myself how to use the plunger!" 2.) "Mom, do you happen to have the house keys on you?" 3.) "Just don't come in right now. Give me 5 to 30 minutes please!" 4.) "No! I do it!" Shortly followed by "mom! Help me!" 5.) "Help! I'm stuck! A lot stuck, not a little stuck like last time!" 6.) "What's mommy and daddy time all about?" 7.) "Get it out of your mouth before mom sees!" 8.) "If I go down the laundry shoot...." I didn't let this sentence go get any further. 9.) "This doesn't fit anymore." This means there's been a growth spurt, which means nothing fits, which then equates to a good chunk of money spent on a new wardrobe. 10.) "This is washable paint....right???" 11.) "When will I be old enough to stay home alone? Like, without you watching me all of the time?" This is brought to you by my comedy duo Max and Harrison Harrison. 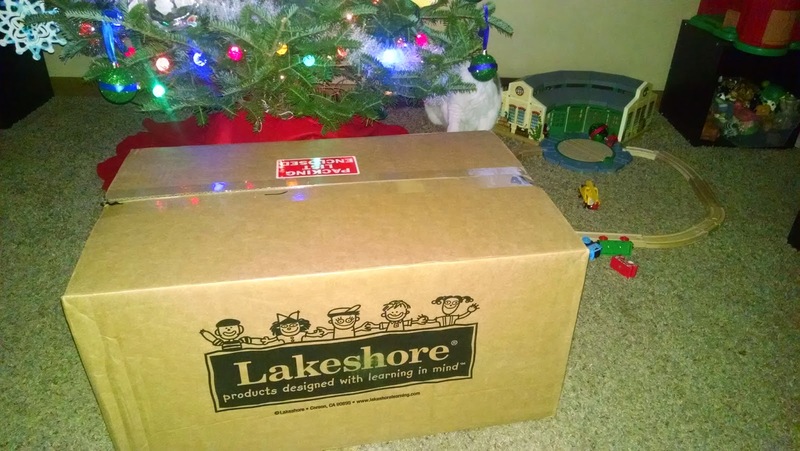 The daycare's Christmas presents arrived from Lakeshore (http://www.lakeshorelearning.com/). I immediately opened the box and have had a great time bringing out a new toy or craft each day. A few of our goodies: Alpha Bots, Slot-Together Translucent Builders, Roll-On Painters, soft seats (http://www.lakeshorelearning.com/product/productDet.jsp?productItemID=1%2C689%2C949%2C371%2C894%2C077&ASSORTMENT%3C%3East_id=1408474395181113&bmUID=1419215685604). Playing Santa Claus. The kids took turns being Santa and kids would sit on "Santa's" lap and tell him/her what they wanted for Christmas. We had a pasta play afternoon. The kids decorated stocking paper shapes with the new roll on painters. Christmas cookie decorating wasn't quite as messy this time around because I spread all of the frosting and the kids were in charge of the sprinkles. I got to enjoy Harrison's (the middle mini) Christmas program and party at school. Santa was a special visitor and delivered a book to each child. Such a fun morning! 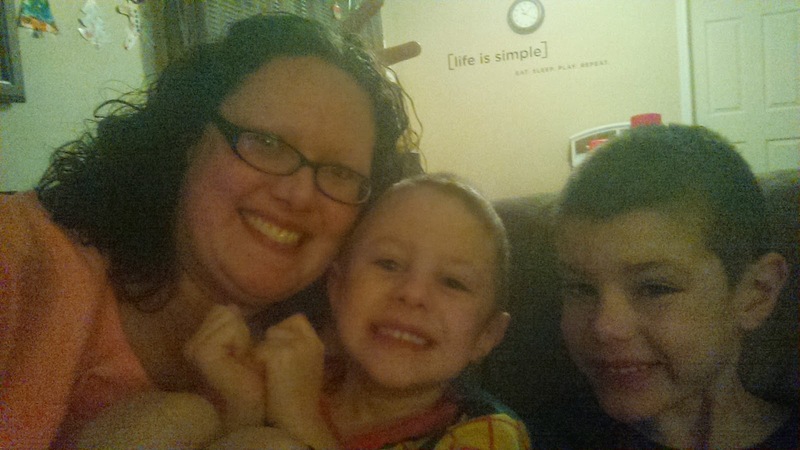 We spent an evening at Harrison's school having a family movie night (we watched "The Polar Express"). The new Alpha Bots. At first I thought they were the stupidest toy I've ever bought, but the kids proved me wrong by playing with them all day long! Even my 6 1/2 year old loved them. The kids spent a good part of the week playing trains on the living room floor. A few of the cutest reindeer you'll ever see! Of course, the new Alpha Bots got the kid's imaginations going and they played robots. We had an impromptu Grinch Day. 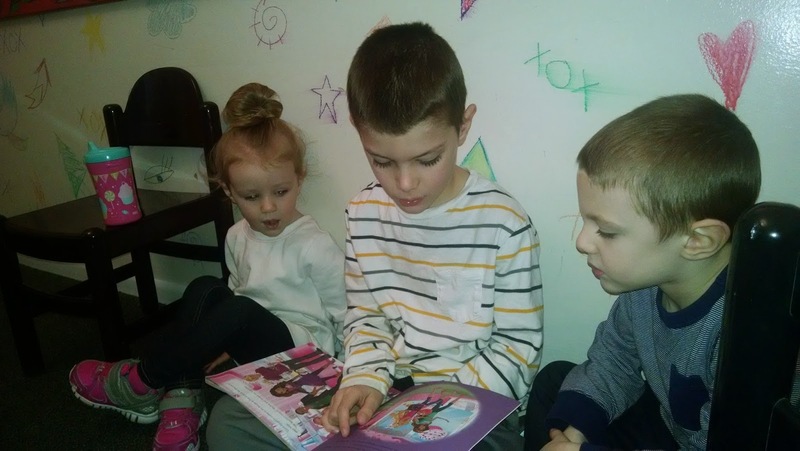 First we read the book, then watched the movie (the kids love comparing books and movies). 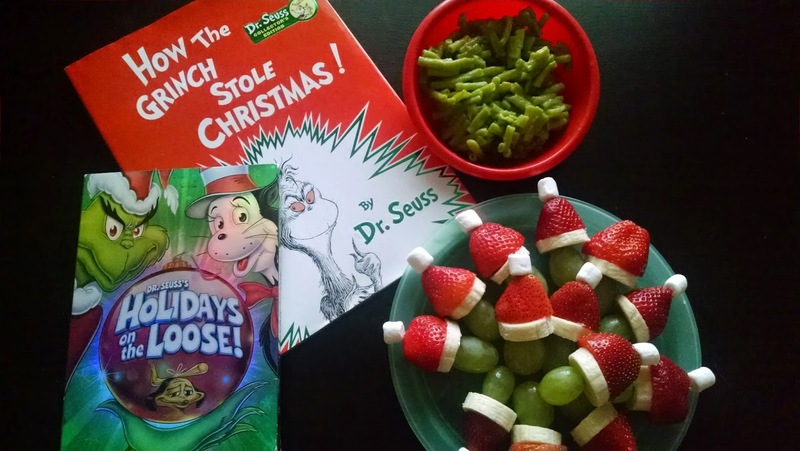 We had Grinch mac and cheese for lunch (thank you green food coloring) and Grinch hats for afternoon snack (a grape, banana slice, strawberry, and marshmallow on a toothpick). Next week will be a super short 2 day daycare week. BUT we've got lots planned for those two days: pajama day, Sensory Play Day, Christmas movies to watch, books to read, puzzles to complete, games to play, and of course, the daycare Christmas party!